Putin and Trump do one-to-one talks bring the world’s focus to Helsinki. 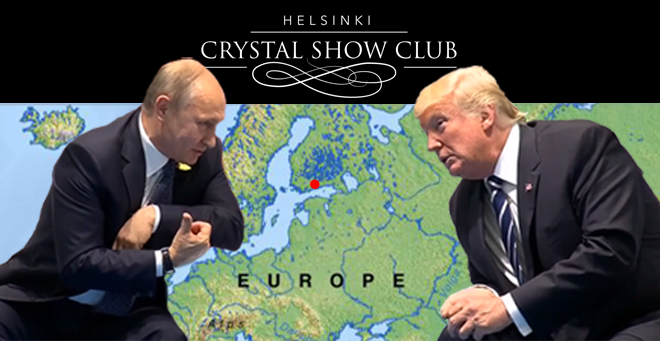 World leaders Putin and Trump are set to meet in Helsinki on July 16th, just around the corner from the best striptease club in the city. When the leaders of two top superpowers in the world meet, usually nothing is quite like what it seems. While one burning question will certainly be answered before the meeting gets started (who wins the 2018 world cup), for the common man there are likely going to be more questions that are not going to get an answer. And that applies both before and after the Helsinki Summit. Are Trump and Putin Friends? Did the Russians really interfere with the US elections? Is there going to be a trade war? What are these two somewhat unorthodox leaders planning and how will it ffect the rest of us? Even Google Trends seemed to (at least at the time of writing) suggest that it is primarily the Finns who are interested in the topic “Helsinki Summit”. Some how it doesn’t seem correct, and we wait to see how that develops. In the world of adult entertainment we have long since learned that politics do not belong to our line of business. Sure, both leaders are controversial. You may not even like either man. (Even in peaceful Helsinki there are several protests planned for the day of the meet). Nobody knows what the two men will be discussing. Our focus at Crystal Show Club is to look after the tourists, journalists and bodyguards who will be in town for the event. We have a long standing commitment to service and customer satisfaction. Our aim is to make your evenings enjoyable, and if we can make your stay in Helsinki a bit more enjoyable. A former intelligence officer and now the president of Russia.